Robert Turner’s kiln, Alfred Station, NY. The Alfred Ceramic Art Museum welcomes the new year with an exhibition titled Kilns of Alfred: Transactions with Fire, Feb. 21 through July 28. The exhibition opens Feb. 21 with a free public reception from 5-8 p.m.
ALFRED, NY – The Alfred Ceramic Art Museum welcomes the new year with an exhibition titled Kilns of Alfred: Transactions with Fire, Feb. 21 through July 28. The exhibition opens Thursday, Feb. 21 with a free public reception from 5-8 p.m. 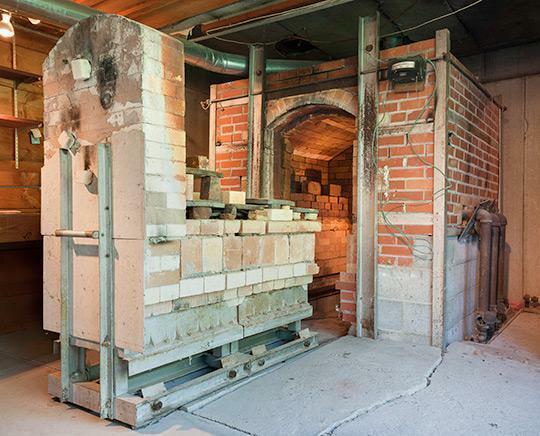 Kilns of Alfred: Transactions with Fire focuses on the fact that ceramic art is related to the firing of clay objects in a kiln or chamber of heat. The exhibition is organized around a series of extraordinary photographs by acclaimed photographer Brian Oglesbee that capture the uniqueness of the individual kilns used by the renowned ceramic artists of Alfred, NY, who were also faculty members of the art school at Alfred University, beginning with Robert Turner (1913-2005), Theodore Randall (1914-1985), William Parry (1918-2004) and Val Cushing (1931-2013). Examples of the ceramic artwork fired in their kilns accompanies the photographs. The exhibition continues by offering images of the individual kilns and artwork of current well-known artists working in ceramics in Alfred, who are also faculty of the New York State College of Ceramics at Alfred University: Wayne Higby, Anne Currier, John Gill, Andrea Gill, Walter McConnell, Linda Sikora, Linda Sormin, Matt Kelleher and Jonathan Hopp. Additionally, the exhibition features the work of ceramic artists who support the ceramic art program of the School of Art and Design through their exceptional artistry, technical achievement and teaching: Shawn Murrey, Hannah Thompsett, Keith Simpson and Jason Green. Their work is installed in the Museum gallery area that features photographs of the legendary indoor and outdoor kiln facilities of the art school. The work of visiting artists Kahlil Irving, the current Robert Turner Teaching Fellow, and Shoko Teruyama are highlighted as well. Selections connected to the visiting artist and MFA collections of the Museum will also be on view. At the center there is fire.